For many years after its creation in around 1079, the New Forest was the playground of Kings and the aristocracy, a place where the deer roamed free, and were hunted for pleasure and the pot. William the Conqueror’s second son, William 11, or William Rufus, as he was also known, hunted locally on a fateful day in August, 1100. An outspoken, bad tempered man with ruddy complexion, William was in the company of a group of friends and supporters, or so he thought. But whether by accident or design, William met his death that summer’s day, victim of an arrow allegedly shot by Sir Walter Tyrrell, an Anglo-Norman nobleman maybe acting under orders from William’s younger brother, who immediately took the throne as Henry 1. 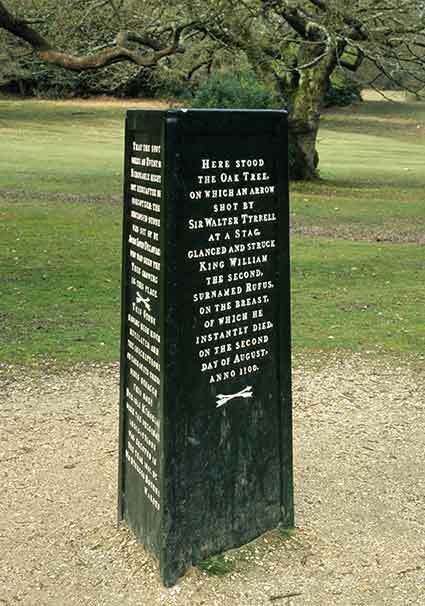 The Rufus Stone in Canterton Glen, near Minstead, commemorates the event, and it is claimed marks the place of William’s death; although it has been suggested that the incident actually took place 15 kilometres (10 miles) to the south-west, close to Park Farm. The stone was erected by Lord Delaware, of Bolderwood Lodge, in 1745, but was so damaged by souvenir hunters, who chipped off bits to take home, that in 1841 it was encased in the commemorative metal surround that can still be seen today. Sir Walter Tyrrell is also remembered in the name of a nearby pub.